A billboard on North Federal Avenue in Mason City featuring a picture of Jodi Huisentruit urges citizens with information on her disappearance to come forward. MASON CITY — CBS news documentary “48 Hours” will focus on Jodi Huisentruit’s disappearance in an upcoming episode, tentatively scheduled to air Saturday evening, and it includes efforts to interview a man law enforcement has labeled a person of interest in the case. A promotional clip for the episode mentions John Vansice. Toward the end of the promo, a reporter is seen knocking on a door. Vansice, who now lives in Arizona, was an acquaintance of Huisentruit and is believed to be one of the last people to see the then 27-year-old KIMT anchor alive. He videotaped a birthday party he threw for Huisentruit just days before her disappearance. Vansice said Huisentruit was at his house the night before her disappearance, watching that tape. Vansice said he passed a polygraph test shortly after Huisentruit’s disappearance on June 27, 1995. In March 2017, the Mason City Police Department executed a search warrant against John Vansice, whose legal name is Arthur John Vansice. Vansice is named on the search warrant for GPS data from a 1999 Honda Civic and 2013 GMC 1500. The warrant was sealed the same day, meaning no other information is publicly available about why the search was ordered or what was discovered. In October 2017, a judge ordered the documents would remain sealed for another year. The seal was extended again in September, through Sept. 28, 2019. In 2004, police checked the basement of a home formerly occupied by Vansice, but said the search yielded no new information. Huisentruit, a news anchor at KIMT, disappeared while on her way to work June 27, 1995, in Mason City. Investigators have never found Huisentruit. Huisentruit told a colleague she was on her way to work early that morning but never arrived. Police found signs of a struggle outside her Mason City apartment. She was declared legally dead in 2001, and no one has been charged in her disappearance. “48 Hours” is an investigative news program focusing on crime and justice cases, including cold cases. “48 Hours” producers approached people with FindJodi.com and began working on the episode after attending the dedication of three billboards June 5 in Mason City. That date would have been Huisentruit’s 50th birthday. Four billboards featuring Huisentruit’s photo and the message “Somebody knows something...is it YOU?” were installed in high-traffic areas around Mason City by FindJodi.com, a website devoted to solving the case. MASON CITY | Documents related to a search warrant against a person of interest in the Jodi Huisentruit case will remain sealed for another year, documents say. The episode includes several elements of the Globe Gazette’s coverage of Huisentruit’s disappearance. Since FindJodi.com was launched in 2003, the website has received several hundred tips and leads. The website and its backers paid for three of the billboards; the fourth was donated. A preview of the episode aired Friday night. The episode is scheduled to air at 9 p.m. Central on Saturday. Anyone with information about Huisentruit’s disappearance is asked to contact Mason City Police Lt. Rich Jensen at 641-421-3636. Mason City Police Capt. Mike Halverson oversees the removal of Jodi Huisentruit's car from the Key Apartments. Huisentruit was reported missing on June 27, 1995. To Halverson's left is tow truck driver Terry Grell and Officers Craig Prahm and Tiffany Creekmur. Globe-Gazette photo by JEFF HEINZ. Mason City Police officers check in front of Jodi Huisentruit's car for clues to her disappearance. Mason City Police Deptartment records manager Lowell Willock, officers Tiffany Creekmur and Craig Prahm, and investigator Susan Linkenmeyer at the scene of the Key Apartments parking lot on the day Jodi Huisentruit disappeared in 1995. Globe-Gazette photo by JEFF HEINZ. Mason City firefighters from the left, Steve Bull, Larry Meggers and Bruce Quam search in the Winnebago River behind Jodi Huisentruit’s apartment for clues to her disappearance. Globe Gazette File Photo/Michael Faas Media from Minn. and Iowa gather at the Mason City Police Department, on June 29, 1995 for a news conference on the disappearance of KIMT anchor woman Jodi Huisentruit. Huisentruit was reported missing, during the early morning hours of June 27, 1995. Globe Gazette File Photo/Michael Faas. Mason City Police Department Investigators seach a dumpster for any clues leading to the disappearance of KIMT anchor woman, Jodi Huisentruit. Huisentruit was reported missing in the early morning hours of June 27, 1995. Globe-Gazette photo by JEFF HEINZ. Lowell Willock, right, of the Mason City Police Department, dusts a light post for fingerprints outside the apartment of Jodi Huisentruit. Huisentruit lived in the Key Apartments at 600 N. Kentucky Ave. at the time of her disappearance. Huisentruit's Mazda Miata is to the left of Willock. Next to the car was found shoes, keys and other items scattered on the ground. A bumper sticker for missing KIMT-TV anchor Jodi Huisentruit. Mason City Police Department Investigators seach a dumpster for any clues leading to the disappearance of KIMT anchor woman, Jodi Huisentruit. Huisentruit was reported missing in the early morning hours of June 27, 1995. From the left, Mason City Police Department records manager Lowell Willock, officers Tiffany Creekmur and Craig Prahm, and investigator Susan Linkenmeyer at the scene of the Key Apartments parking lot on the day Jodi Huisentruit disappeared, June 27, 1995. Lowell Willock, right, of the Mason City Police Department, dusts a light post for fingerprints June 27, 1995 outside the apartment of Jodi Huisentruit. Huisentruit lived in the Key Apartments at 600 N. Kentucky Ave. At the time of her disappearance. Huisentruit's Mazda Miata is to the left of Willock. Next to the car were shoes, keys and other items scattered on the ground. Globe-Gazette photo by JEFF HEINZ. Mason City firefighters, from the left, Steve Bull, Larry Meggers and Bruce Quam search in the Winnebago River behind Jodi Huisentruit's apartment for clues to her disappearance. From the left, Mason City Police Records Manager Lowell Willock, officers Tiffany Creekmur and Craig Prahm, and investigator Susan Linkenmeyer at the scene of the Key Apartments parking lot on the day Jodi Huisentruit disappeared, June 27, 1995. Media from Minnesota and Iowa gather at the Mason City Police Department, on June 29, 1995 for a news conference on the disappearance of KIMT anchor woman Jodi Huisentruit. Huisentruit was reported missing, during the early morning hours of June 27, 1995. Beth Bednar, author of "Dead Air," a book about the disappearance of Jodi Huisentruit, speaks during a gathering of friends and the FindJodi.com group June 5, 2018, in Mason City on the news anchor's 50th birthday. One of four new billboards in Mason City featuring pictures of Jodi Huisentruit, urging citizens with information on her disappearance to come forward, is seen May 31, 2018, on North Federal Avenue in Mason City. Rose Tobin of Mason City leads a group of approximately 35 people down North Kentucky Avenue on June 27, 2015, for the Walk for Jodi memorial walk in Mason City. The group began the walk at the Riverside Friends Church across from the Key Apartments and ended at the KIMT television station where Jodi Huisentruit worked when she was abducted in 1995. Tobin was the manager of the Key Apartments where Huisentruit lived at the time of her abduction. People pray before a walk in memorial of missing KIMT news anchor Jodi Huisentruit on June 27, 2015, in Mason City. The walk went from Riverside Friends Church to KIMT studios. The church is across the street from the apartments where officials believe the anchor was abducted in 1995. She has never been found. Students in the YMCA Teen Leadership program release balloons during the candlelight vigil in June 2000 at KIMT for Jodi Huisentruit. Investigator Frank Stearns looks through the file of the Jodi Huisentruit case. Amy Kuns of KXLT Fox 47 listens to the announcement by Sheriff Kevin Pals on July 15, 2004, that the remains found were not that of her former KIMT co-worker, Jodi Huisentruit. 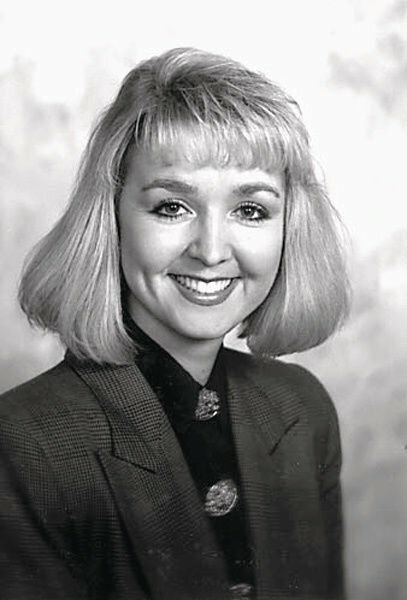 John Vansice, an acquaintance of Jodi Huisentruit, is believed to be the one of the last people who saw the 27-year-old news anchor alive before her disappearance on June 27, 1995. Regan Banks talks to students in the YMCA youth groups during a ceremony in June 2000 for missing anchorwoman Jodi Huisentruit, outside the KIMT studio. The event marked the five-year anniversary since her disappearance. Mason City Police officers check in front of Jodi Huisentruit's car for clues to her disappearance, June 27, 1995. Lowell Willock, right, of the Mason City Police Department, dusts a light post for fingerprints June 27, 1995 outside the apartment of Jodi Huisentruit. Huisentruit lived in the Key Apartments at 600 N. Kentucky Ave. at the time of her disappearance. Huisentruit's Mazda Miata is to the left of Willock. Next to the car was found shoes, keys and other items scattered on the ground. KIMT TV reporter Stephanie Angelson wipes a tear away during the candlelight vigil for Jodi Huisentruit, June 27, 2001, at the KIMT studio. The vigil marked the sixth anniversary of the disappearance of the TV anchor woman. After '48 Hours', Jodi Huisentruit tips pick up at Mason City Police Dept. MASON CITY — Tips in the Jodi Huisentruit case picked up after a CBS news documentary aired Dec. 15.